A blog reader survey is more than learning about WHO is in your audience. 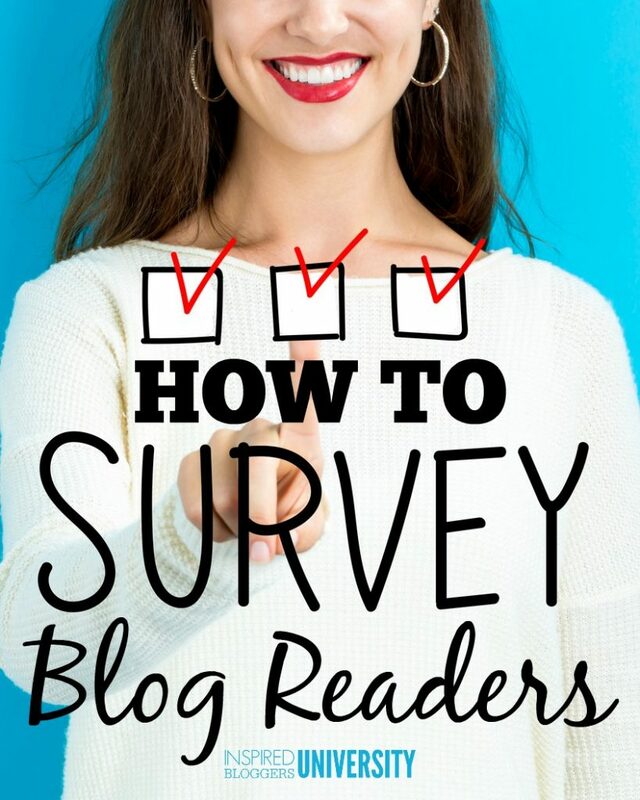 Creating effective reader surveys help you tune your blog content (and products) toward the needs of your audience, resulting in greater page views and profits. Are you scratching your head and wondering what your readers want from your blog? Maybe you have spent time writing blog posts that they never share. Perhaps you even launched a product that no one bought. Ummm… have you considered asking your readers what they need? Conducting a reader survey is a simple and fast way to know more about your audience. <— That’s value-packed information! Once you know your reader’s biggest problems, you can provide solutions through engaging content and products. Learn to Create Digital Products Your Audience Will Buy! Before we get to the products, do you realize how important it is to know who your readers are? GREAT! Creating a target audience/avatar helps you define your ideal reader. By narrowing your audience to similar interests, you create a more profitable blog without needing more page views. But, how do you know if you are actually connecting with your avatar? It’s time to conduct a reader survey. Surveying your readers is not a difficult process. It can be as simple as asking one question in each email or social media post and recording the answers. However, you must start with a purpose for your survey. 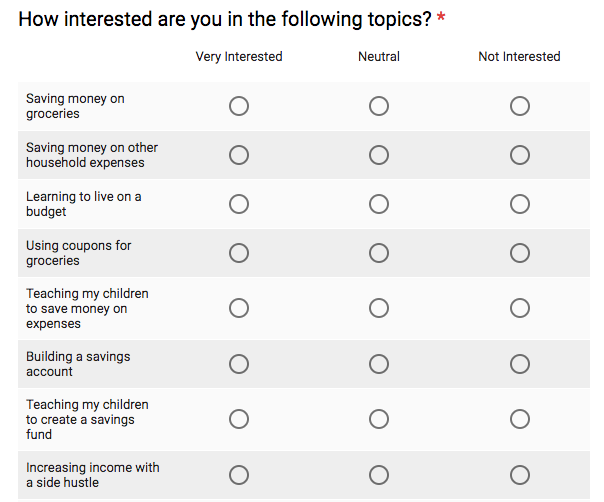 What the purpose of a blog reader survey? We have agreed that you need to know who your audience is and what they need, but asking your readers a bunch of questions will not help you unless you already have a purpose in mind. What exactly do you want to know from your readers? And “what do you like hearing from me” or “what do you want to hear from me next” is not exact. As a matter of fact, I would challenge you to NEVER ask your readers that question. Why? Because that puts too much pressure on the reader to create your editorial calendar. Most people will see those questions and shrug, “I don’t know so I will skip it.” You need to plant the thought – the direction you want to take – and allow the reader to respond. While polling your blog readers IS about gathering information, a blog survey is a tool for clarifying your next step, blog post, product idea. Several years ago, I had a product idea but wasn’t sure if my audience has interest in the topic. So, I conducted a reader survey and chose the questions with my end goal in mind… finding out if they would buy. I asked a total of SEVEN questions. Want to see a REAL example of a previous reader survey? Sign up for FREE access to the Blogger Resource Library. Of those questions, FOUR were to gauge the product interest. ONE question was to brainstorm post ideas based on my categories, ONE question helped me find more blogs like mine (more on this below,) and the last question was open-ended so the readers could share anything about the topic they wanted me to know. Which survey tool should you use? You don’t need an expensive program to survey your readers. Sign up for a free account with Survey Monkey or use what I do… Google Forms. Create your form and embed it into a page or post or send the link to your email subscribers. How often should you survey your readers? My habit is to conduct a reader survey once a year. However, if you find you are experiencing a season of rapid growth, you might consider doing it biannually. Should you host a giveaway to get more people to respond? It depends. If you are sending your annual blog survey to email subscribers, it’s not a bad idea. However, if you are posting your questions on your blog or in your social media, do not use an incentive. Hosting an open giveaway to get people to answer your survey is an invitation to people who stalk the internet looking for chances to win prizes. These sweepstakes pros will contaminate your results. So don’t be afraid to survey a small portion of your audience. (Typically, only 1% of my audience ever responds.) Even if you receive fewer answers, you want those who respond to your survey to actually be readers. Yes or no questions might get the highest engagement because they are easy and require zero thought, but they will not give you the depth of information you receive when you ask questions that allow any answer. When readers respond to your open-ended questions, they are providing you with an abundance of information including blog post ideas, search engine keywords, and copy for your product descriptions. What is your greatest struggle in (XYZ topic)? If you could change anything about (XYZ), what would it be? What would you like to tell me about your family? What is the most important thing to you about (XYZ)? REMEMBER: “What do you like hearing from me” or “what do you want to hear from me next” is not an acceptable question, even if it is open-ended. 2. Focus on one (or two) topics. Although you might have eight blog categories, your survey should focus on the topics where you plan to focus. <<— This goes back to your purpose. If you have an idea for a series of blog posts, ask about their interest using a scale. This is a great opportunity to validate your blog post ideas and categories. How interested are you in (XYZ topic)? 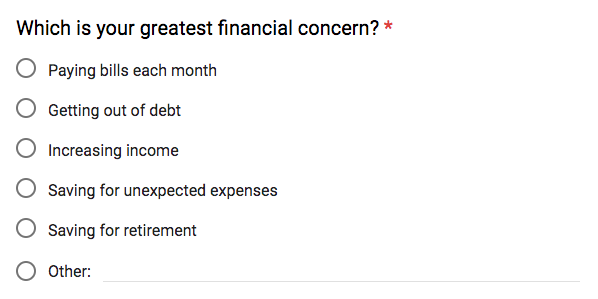 How concerned are you with (XYZ topic)? How much time do you spend each week on (XYZ activity)? If you are thinking beyond a blog post to a product (like a course or book), you can dig deeper and ask a follow up question about their confidence on the topic. When the majority of your readers respond that they lack in confidence, you know you have a solid product idea. Of course, people might need your product, but will they buy it? To determine how serious they are about your topic, ask questions based on an amount of time or money. How qualified do you feel to (XYZ action)? Are you planning to (XYZ activity) within the next three months? How much money would you be willing to spend to solve (XYZ problem)? Despite trying to attract a specific audience, many blogs often attract multiple audiences. If you are curious about why people are coming to your blog, you can ask about their greatest concern. The options should actually reflect your blog categories or a subsection of your topic. Rank this list based on its importance to you. Where is your primary focus right now? Which of these represents your immediate goal? 4. Locate your blog twins. While you have your audience talking to you, ask about their other favorite places. This is not about finding and duplicating your competition. Instead, you are looking for patterns in the type of content produced or the topics covered across their favorite websites. Also, if a reader’s responses are in line with the results you wanted (making them your ideal reader), you can guess that MORE of your target audience is reading the other blogs. When you know where your audience is, pursue them! Build a relationship with those bloggers and guest post on their blogs. When the readers have responded and you have a spreadsheet of information, it’s time to dig into the information. As you review the blog survey results, look for patterns in their responses. What similarities do you find between your readers? One of the biggest surprises I ever discovered about my readers was a sub-audience of grandparents who were raising their grandchildren. Another surprise was when a large majority of those responding all replied to an open-ended question with a similar struggle that I had not even considered as a potential topic. Make a running list of blog post ideas based on similar responses. Highlight specific keywords to research in your favorite keyword tools. Save key phrases to use as copywriting on a product landing page. Look for a silent but connective topic that can link everything together in a product. Locate affiliate marketing partners that can support your blog’s message and provide solutions for your reader’s problems. Reach out to specific readers (if you collect their email addresses) and ask for clarification on a topic if needed. Schedule a short phone call to get to know your ideal readers better. Build relationships with the additional blogs listed for collaborations and guest posts. Save time by using a blog reader survey to plan your content and products. You will learn more about your audience but will also experience greater success as you strive to grow a profitable blog. Need a sample blog reader survey? Sign up for FREE access to the Inspired Bloggers Resource Library and receive a sample blog reader survey as well as numerous other printables, audios, and videos.